Geneva, Oct 20 (IANS) Nearly fifty-eight per cent of the about 600,000 Rohingya refugees in Bangladesh are children who suffer from severe malnutrition, a UN report released said. The UN Children’s Fund (Unicef) report also said that these children were highly exposed to infectious diseases, Efe news reported. “In a sense it’s no surprise that they must truly see this place as a hell on earth,” said Simon Ingram, Unicef official and author of the report. Titled “Outcast and Desperate: Rohingya refugee children face a perilous future” was released at a press conference in Geneva, Switzerland. After two weeks in Cox’s Bazar, a southern Bangladesh town where nearly 600,000 newly arrived refugees are crammed into a crowd of 200,000 Rohingyas who had fled earlier, Ingram described the situation fraught with “despair, misery and indescribable suffering”. The report also highlighted several drawings of children with uniformed soldiers killing people and helicopters spraying bullets from the sky. In mid-August, the Arakan Rohingya Salvation Army (ARSA) carried out a coordinated attack on security posts in Myanmar, sparking a violent response from the military which led to thousands of Rohingyas in Rakhine state fleeing to neighbouring Bangladesh. Ingram explained that very little is known about what is happening in Rakhine, since humanitarian agencies have not been able to enter the region since August. Most of the refugees “are already undernourished, since the repression also included the burning of food stores and the destruction of crops”, he said. According to the Unicef estimates, one in every five children under the age of five is suffering from acute malnutrition and about 14,500 suffer severe acute malnutrition. Ingram explained that the main danger of infectious diseases have been mitigated with the vaccination campaign against cholera, measles and polio, but much remains to be done to tackle these risks. He added the situation worsened with the lack of clean drinking water as these children consumed only contaminated water which is another main source of infection. With regard to child protection, the expert welcomed the fact that the number of unaccompanied children had decreased to 800, with the identification tasks carried out by the various humanitarian agencies on the ground. Regarding sexual abuse or forced or early marriages, Ingram explained that for now they have only punctual evidence, but that it is a real risk in any situation such as in Cox’s Bazar. What does occur relatively frequently, he said, is child labour. In the area of protection, the essential issue is the status of these people. Not only do they have to be recognized as refugees, but also that newborns in the countryside or along the way, he said, should be able to obtain some kind of birth certificate. 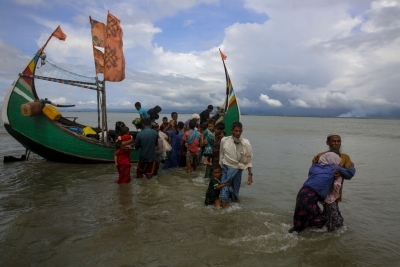 Unicef and the UN High Commissioner for Refugees (UNHCR) are negotiating with the Bangladeshi authorities the possibility of issuing birth certificates for newborn Rohingyas, but the talks are still in process. The Rohingyas are a Muslim minority that Myanmar does not recognise as citizens and are therefore stateless.